Another great thing about being pregnant is getting to wear something like this. I got the chance to review this really cute funny shirt . I choose this one coz I always get the "your pregnant again" comment. This shirt is just way to adorable and fits perfectly. And its a perfect way to send out the message yes this is going to be my last one. Family and friends really love this shirt and I have gotten a lot of smiles and giggles from them when I wear this shirt. 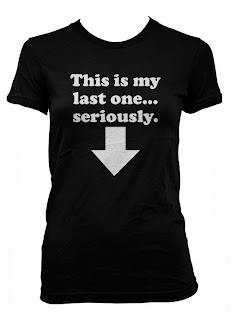 Maternity Shirts have a great selection of these funny novelty items such as this. Please be sure to check out their site for more. You can also find them on Facebook, Twitter, Instagram, Pinterest and Google+. That shirt is too cute Lala! You look great my friend. I surely do miss you. Fab post! Hello from Spain: I like the shirt. Very trendy .. We keep in touch. OMG!!! lol this is so so cute!! i love this so adorable!! The tee is so funny and you look so sweet Lala! Kisses! Love the t-shirt it is so funny :) congratulations. Love that shirt. I just found the pic last night on pinterest for today's post! I'm sure it elicits lots of giggles and conversation. Haha, that is such a cute shirt! Adorable! Haha I LOVE this shirt. It's so cute and fun! I love that shirt, SO pretty! Okay that is way too cute! Plus I LOVE great fitting t-shirts, I basically live in them. That is such a fun and cute top! haha, what an adorable tee!